Caption: East Window of Chapel, Reading Abbey by Francis Wheatley. 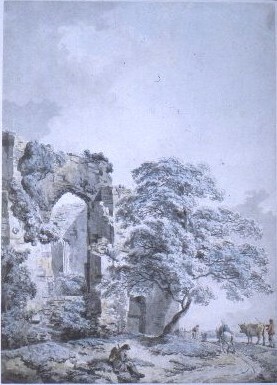 Around 1800 the ruins of Reading Abbey were thought of as `Romantic ruins` and many artists both professional, like Wheatley, and amateur painted them. This appears to show the opening for the window in the east end of the South transcept of the Abbey that can be seen today.